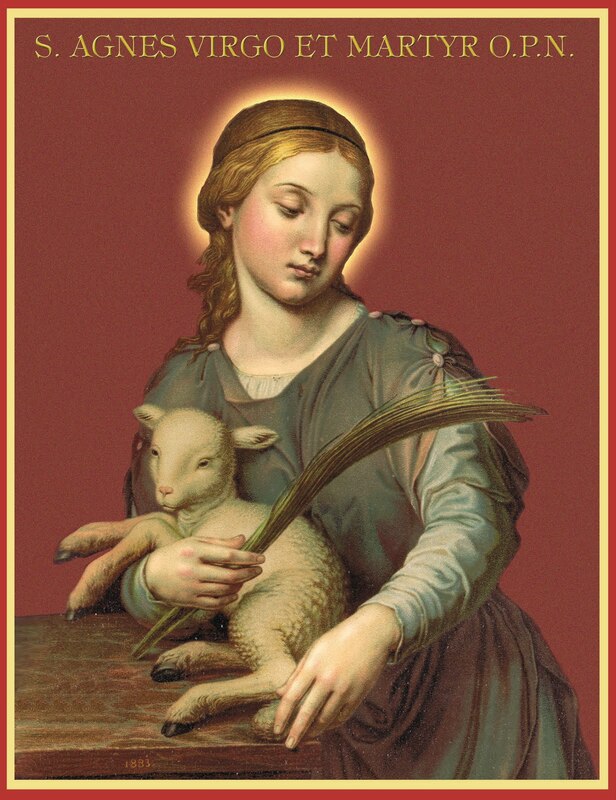 Martyred for her faith at the early age of twelve, Saint Agnes was one of the youngest-known named martyrs in the Communion of Saints. She was born into a wealthy Roman aristocratic family and was remarkable for her beauty as a child. But the true beauty was interior and as a youth she vowed to live a life of purity and chastity, consecrating herself as a virgin. Even though she was not yet a teen, Roman suitors courted her trying to seduce her but she refused all advances. Word reached the Roman Emperor Diocletian who was relentless in his persecution of Christians. Rather than killing her right away, Diocletian’s men sought to discredit her by making her a prostitute and that would further discredit Christianity and dissuade others from becoming Christians. Naturally Agnes rejected all advances and refused to give in to the sins of the flesh. This further infuriated Diocletian and his cohorts who dragged her before the governor. He ordered that she be thrown into the fire. God preserved her beauty inside and out by allowing her to emerge unscathed. The governor then ordered that she be beheaded in a public display but even this the executioner botched, stabbing her in the throat where she died professing her undying loyalty to her One, True God in 304. She was buried on the Via Nomentana where a cemetary stands in her name. Over the centuries Agnes, which means “chaste” in Greek, has become the standard for chastity, purity and virginal innocence and she is always depicted with a lamb – the Lamb of God – Agnus Dei. She (Agnete) is forever commemorated in the Nobis quoque peccatoribus – the Invocation of Saints in the Canon of the Holy Mass. O Almighty God and everlasting God, Who choosest the weak things of the world to confound the strong: mercifully grant that we who keep the solemn feast of blessed Agnes, Thy Virgin and Martyr, may experience the benefit of her pleading with Thee. Through Jesus Christ our Lord, Who livest and reignest, with God the Father, in the unity of the Holy Ghost, God, Forever and ever. Lesson from the Book of Wisdom. I will give glory to Thee, O Lord, O King, and I will praise Thee, O God my Savior. I will give glory to Thy name: for Thou hast been a helper and protector to me, and hast preserved my body from destruction, from the snare of an unjust tongue, and from the lips of them that forge lies: and in the sight of them that stood by Thou hast been my helper. And Thou has delivered me, according to the multitude of the mercy of Thy name, from them that did roar prepared to devour; out of the hands of them that sought my life, and from the gates of afflictions which compassed me about: from the oppression of the flame which surrounded me, and in the midst of the fire I was not burnt: from the depth of the belly of hell, and from an unclean tongue, and from lying words, from an unjust king, and from a slanderous tongue. My soul shall praise the Lord even to death: because Thou, O Lord our God, deliverest them that wait for Thee, and savest the out of the hands of the nations. Grace is poured out upon your lips; thus God has blessed you forever. V. In the cause of truth and mercy and for the sake of justice; may your right hand show you wondrous deeds. Alleluia, alleluia. Matt. 25:4; 25:6 The five wise virgins took oil in their vessels with the lamps; and at midnight a cry arose, Behold the bridegroom is coming, go forth to meet Christ our Lord. Alleluia. Behind her the virgins of her train are brought to the King. They are borne in to You with gladness and joy; they enter the palace of the Lord, the King. Graciously accept, O Lord, the sacrificial gifts we offer You and by the intercession of blessed Agnes, Your Virgin and Martyr, loose our sins. Through our Lord Jesus Christ Thy Son. Who liveth and reigneth with Thee in the unity of the Holy Ghost, one God Forever and ever. R.Amen. COMMUNION ANTIPHON Matt 25:4, 6. The five wise virgins took oil in their vessels with the lamps; and at midnight a cry arose, Behold the bridegroom is coming, go forth to meet Christ our Lord. Filled with heavenly food and drink, we humbly pray You, our God, that we may be helped by the prayers of her in whose memory we have received Your sacrament. Through our Lord Jesus Christ, Who livest and reignest, with God the Father, in the unity of the Holy Ghost, one God For ever and ever. R. Amen. ChristGloria PatriGodGospel of MatthewHoly GhostJesuLordO LordS. Agnes Virgin and Martyr: Missa "Me exspectaverunt peccatores"